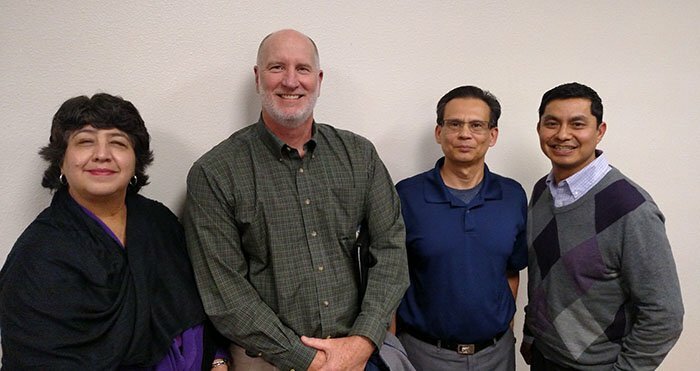 The panel at Monday’s Ministry Forum (from left): Dr. Valerie De La Torre, Dr. Mike Richardson, Dr. Hector Llanes and Dr. Sammy Alfaro. You know you have a provocative topic when even the people who organized it admit they had some trepidation about the discussion it might produce. Unfortunately, that’s the state of the country these days when it comes to immigration, but it doesn’t appear to be the state of Grand Canyon University. The Ministry Forum on Monday, “Welcoming Sojourners and Refugees: A Conversation about Immigration and the Church,” was filled with thought-provoking ideas but no rancor — either spoken or simmering just below the surface. While there was plenty of passion, compassion won the day. Both the panel and the students in audience appeared to be honestly trying to wrap their arms around the issue rather than shake their fists at it. He was joined by three other pastors — Dr. Valerie De La Torre, Dr. Hector Llanes and Dr. Mike Richardson — who have experience ministering to immigrants. They all shared personal experiences that have given them insight into the depth of the issue, but they came at it from a Christian perspective. The second discussion question got into the meat of what fueled many political debates during the election season: obeying the law vs. the Biblical and theological principles of reaching out to those in need. Richardson had an important perspective on this one, too, for a simple reason — he’s also a former police officer. He told the story of a family of illegal immigrants who had been in an auto accident that injured their baby. They were afraid to report it because they thought they might be deported. “It’s just a really different context in which to live,” Richardson said while questioning whether the average American can begin to grasp what it’s like to have all that on your mind as you try to protect your family. Speaking of protection, that’s exactly the reason why Llanes said he once took in an immigrant family — it was for their own safety. The question-and-answer session was equally intriguing, especially when a student of both Hispanic and Caucasian heritage shared how confusing it can be when two sides of the family have such different opinions. It was an appropriate capper to why the topic can be so polarizing. Two more Ministry Forum events remain during this academic year, on Feb. 13 and March 13 in the Colangelo College of Business lecture hall. Both will start at 5 p.m.